At least one is injured after a suspected DUI driver caused a three-vehicle crash Tuesday night in Lakewood, according to the Washington State Patrol. The accident occurred at the intersection of Interstate 5 and Highway 512 around midnight. Three cars were found at the scene – all totaled. The driver of one of the vehicles suffered a broken leg. State Patrol’s preliminary investigation found that the causing driver – a 24-year-old woman – was going west on Highway 512 as two other vehicles were turning left to eastbound Highway 512 from southbound I-5. The suspected DUI driver crashed into one car, causing a chain reaction. The woman was placed under arrest on suspicion of DUI and vehicular assault. Any person who causes an accident while driving under the influence or alcohol or any illegal substance is considered negligent. That automatically means the injured parties in that accident can file a personal injury claim against the drunk driver’s insurance. Let’s make one thing clear: compensation for damages can’t make up for the emotional and physical costs endured in a DUI accident. Unfortunately, there are millions of Americans who drive drunk each year, causing heartbreak to their victims and the families. While steps have been made in recent years to curb the amount of DUIs, about one-third of all DUI arrests are repeat offenders. Drunk driving victims can be saddled with high medical bills to go along with lost wages from work and physical therapy for their long road to recovery. All that combined can make hiring a personal injury attorney a smart decision. They fight for you while you get back to full strength. 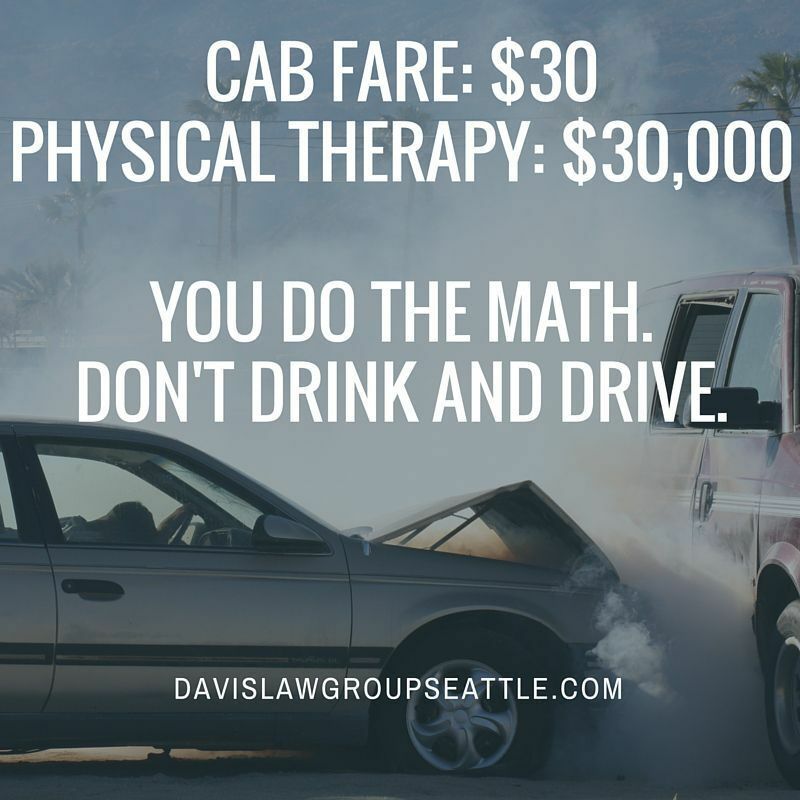 If you or someone you know has suffered an injury because of a drunk driving accident, contact Attorney Chris Davis and the experienced legal team at the Davis Law Group, P.S. Call (206) 727-4000, use the chat feature below or fill out the form on this page for a free case evaluation. If we agree to handle your case, there are no legal fees unless we are successful in getting you money.